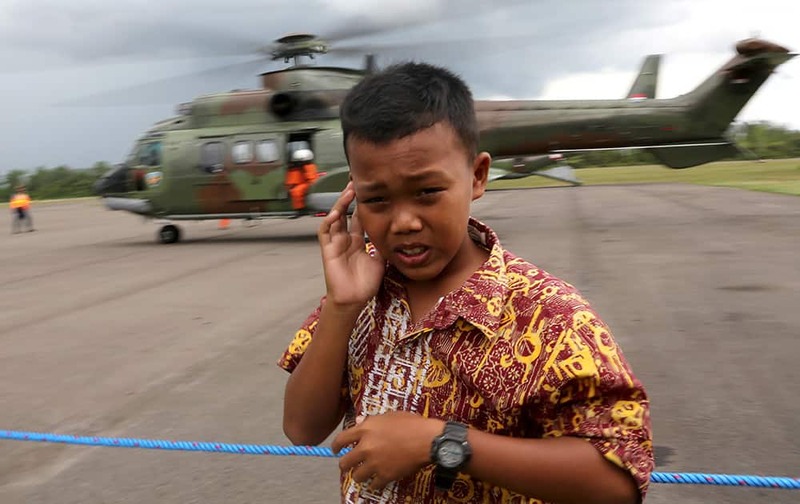 A child covers his ear as Indonesian Air Force's Super Puma helicopter lands after a search operation for the victims and the wreckage of AirAsia Flight 8501 at Pangkalan Bun Airport, Indonesia. 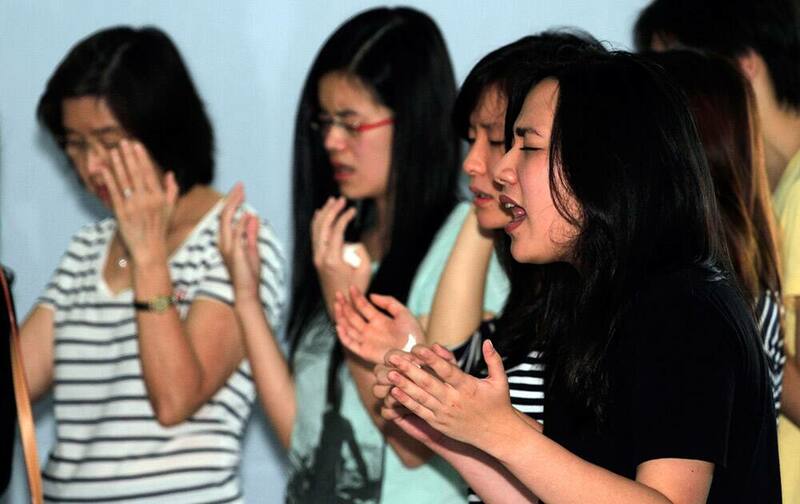 Members of Mawar Sharon church attend a prayer service in Surabaya, East Java, Indonesia. 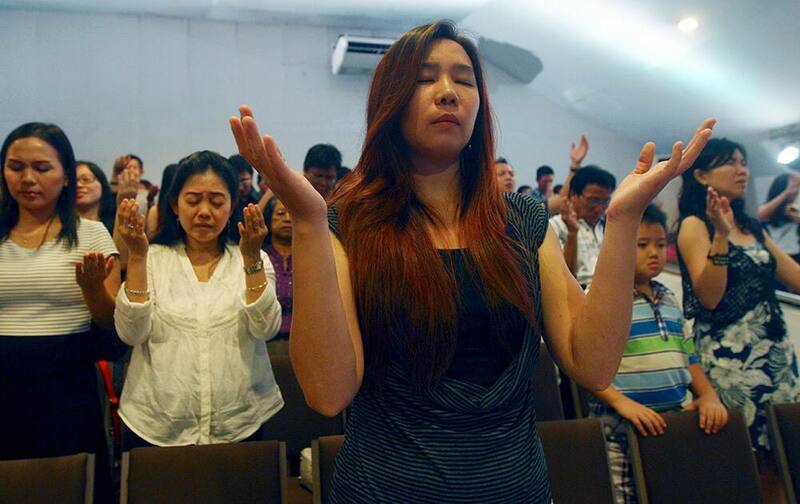 About 40 members of Mantofa's church died in the crash of AirAsia Flight 8501 which took place on Dec. 28, 2014. 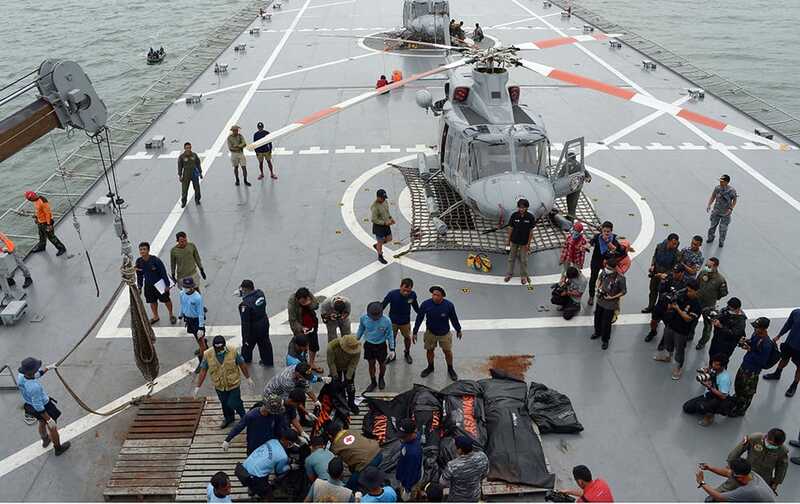 Indonesian's Navy personnel prepare the dead bodies of the passengers of AirAsia Flight 8501, on Indonesian navy vessel KRI Banda Aceh, to transfer them by helicopters at sea off the coast of Pangkalan Bun. 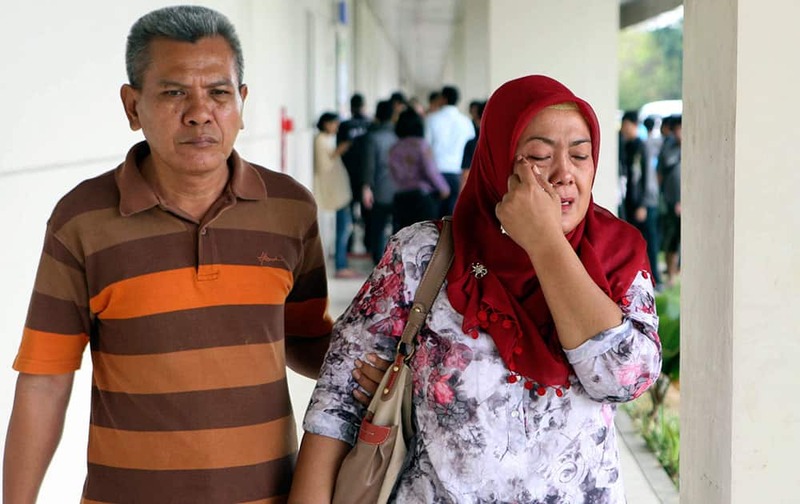 Relatives weep during the handover ceremony of the body of Hayati Lutfiah, one of the victims of AirAsia Flight 8501, to her family at the police hospital in Surabaya, East Java, Indonesia. 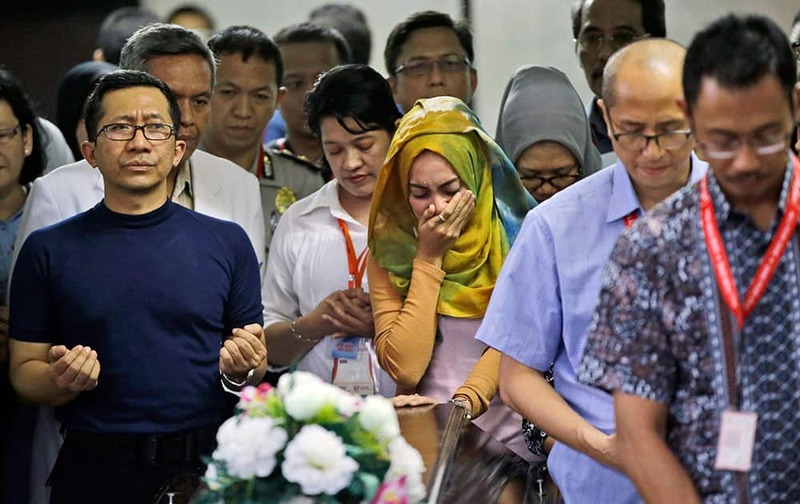 Relatives and airline officials pray during the handover of the body of Hayati Lutfiah, one of the victims of AirAsia Flight 8501, to her family at the police hospital in Surabaya, East Java, Indonesia. 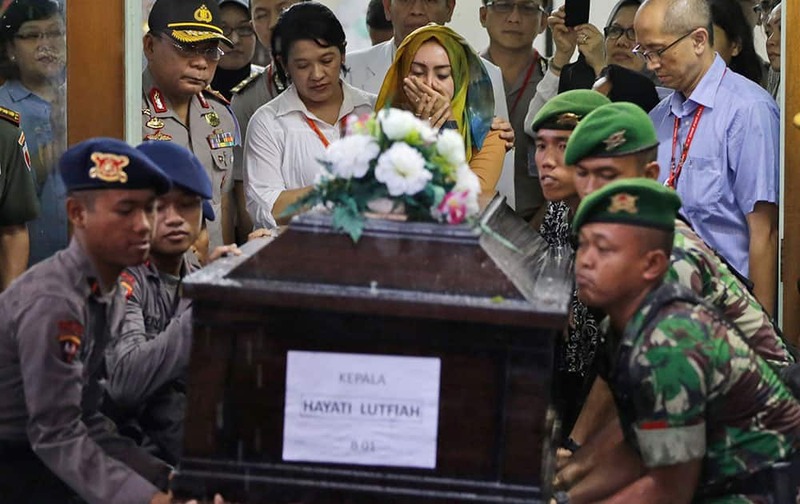 A relative, weeps as Indonesian soldiers lift a coffin containing the body of Hayati Lutfiah, one of the victims of AirAsia Flight 8501, during the handover ceremony to her family at the police hospital in Surabaya, East Java, Indonesia. 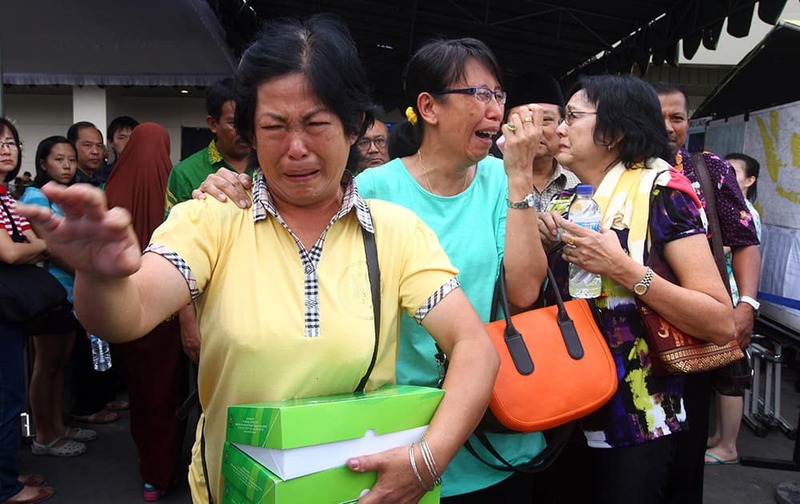 Relatives of passengers of AirAsia Flight 8501 cry after visiting the crisis center at Juanda International Airport in Surabaya, East Java, Indonesia. 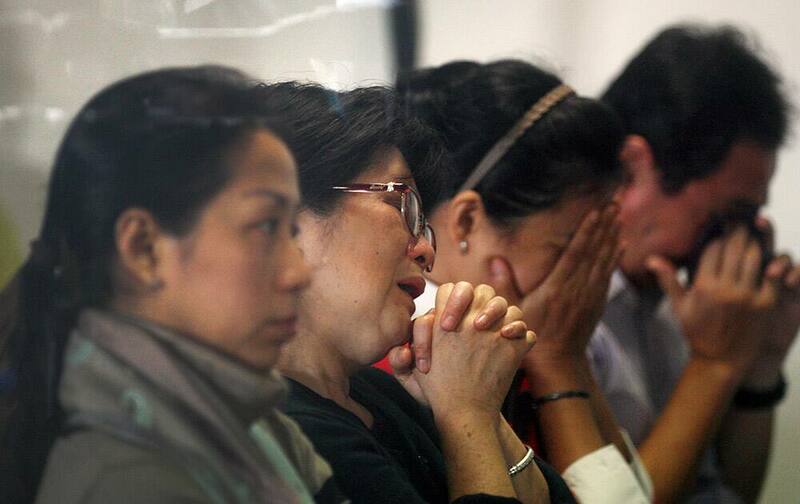 Relatives of passengers of AirAsia Flight 8501 pray at Juanda International Airport in Surabaya, East Java, Indonesia. 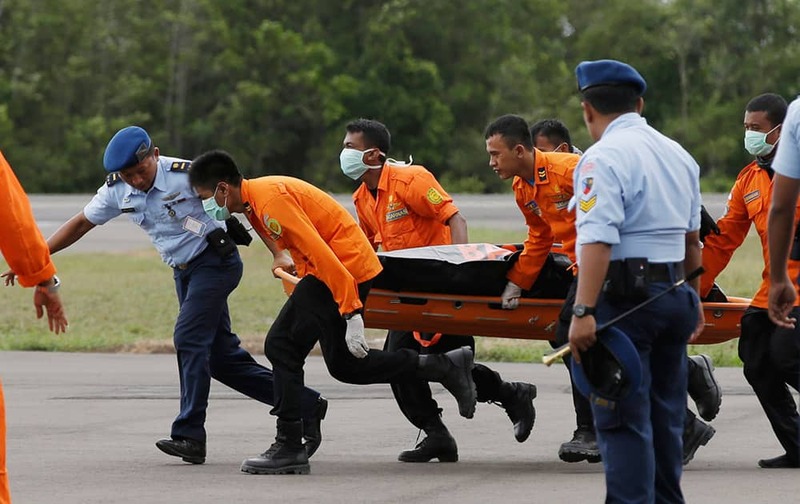 Officers of the National Search And Rescue Agency (BASARNAS) carry a body of one of the victims on board the ill-fated AirAsia Flight 8501, from a helicopter upon arrival at the airport in Pangkalan Bun, Indonesia. 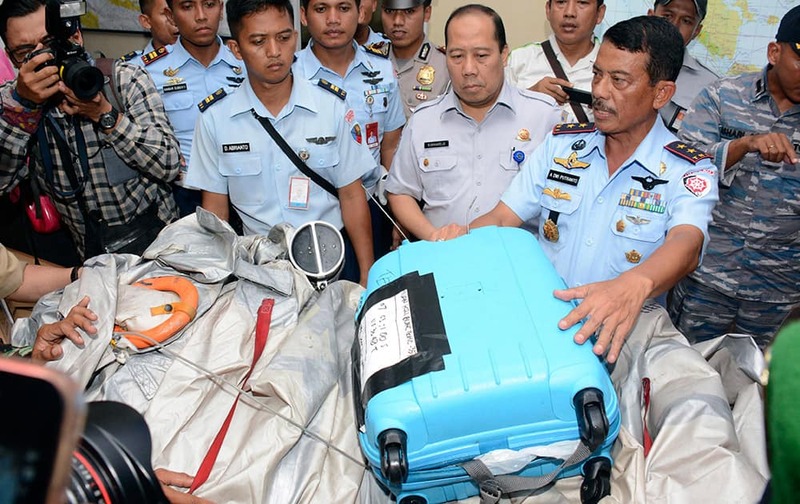 Commander of 1st Indonesian Air Force Operational Command Rear Marshall Dwi Putranto, right, shows airplane parts and a suitcase found floating on the water near the site where AirAsia Flight 8501 disappeared, during a press conference at the airbase in Pangkalan Bun, Central Borneo, Indonesia. 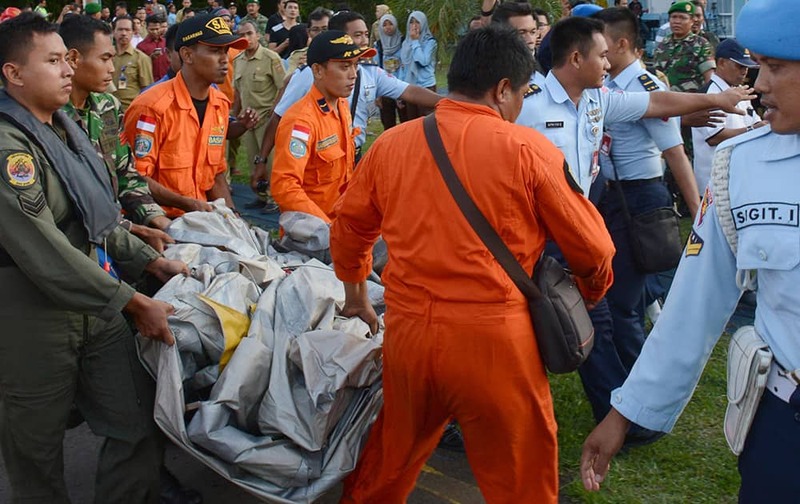 Indonesian Air Force personnel carry airplane parts recovered from the water near the site where AirAsia Flight 8501 disappeared, at the airbase in Pangkalan Bun, Central Borneo, Indonesia. 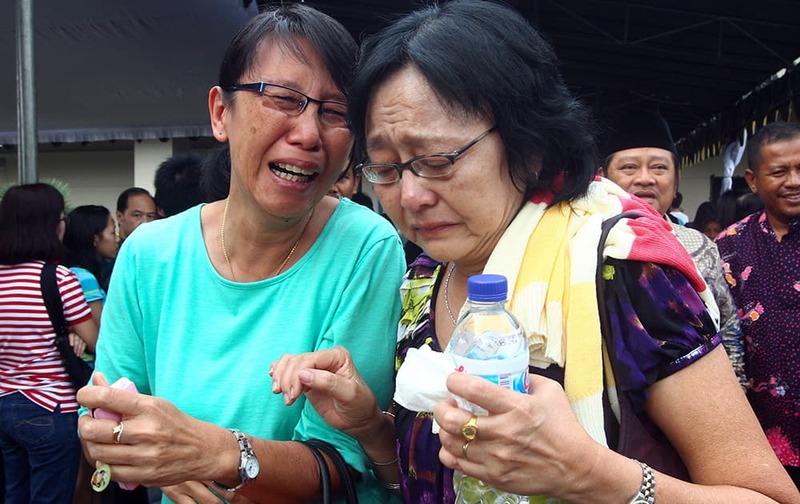 Relatives of passengers of the missing AirAsia Flight 8501 react upon seeing the news on television about the findings of bodies on the waters near the site where the jetliner disappeared, at the crisis center at Juanda International Airport in Surabaya, East Java, Indonesia. 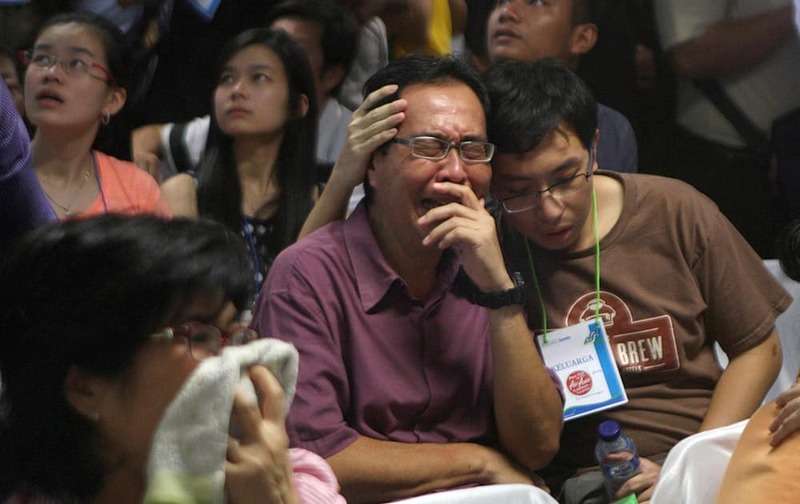 A relative of passengers of the missing AirAsia flight QZ8501 weeps as they wait at the crisis center at Juanda International Airport in Surabaya, East Java, Indonesia. 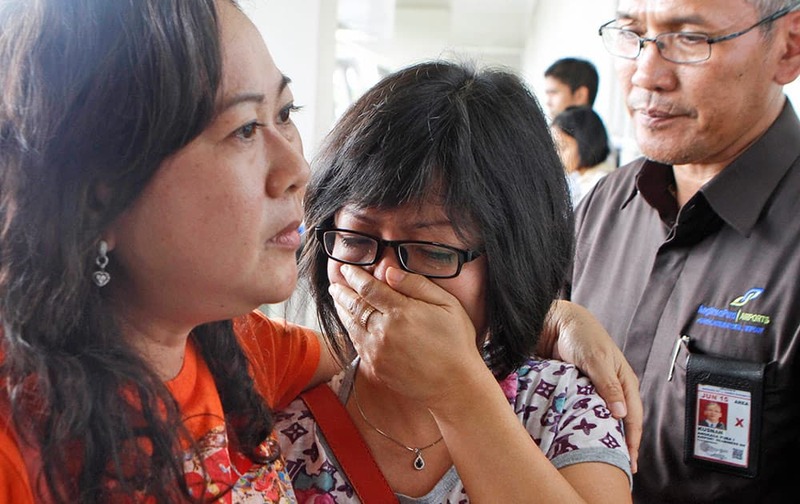 Relatives of passengers of the missing AirAsia flight QZ8501 wait distressed at the crisis center at Juanda International Airport in Surabaya, East Java, Indonesia. 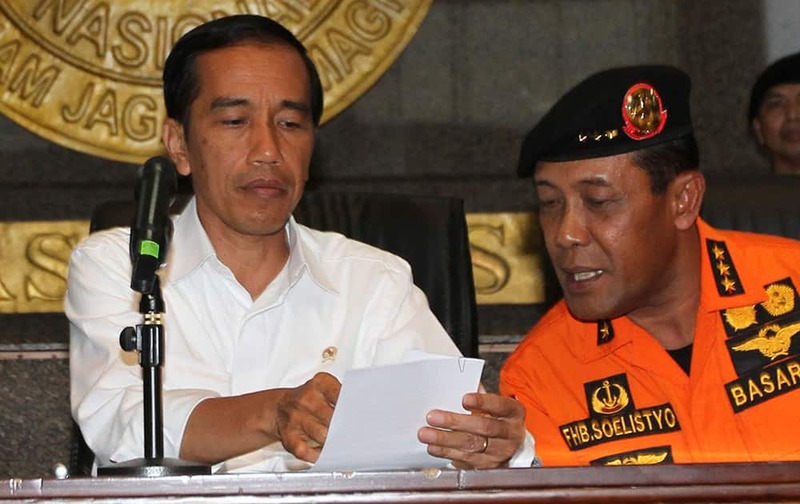 Indonesian President Joko Widodo, talks with F. Henry Bambang Sulistyo, chief of the National Search And Rescue Agency (BASARNAS) during a press conference at BASARNAS headquarters in Jakarta, Indonesia. 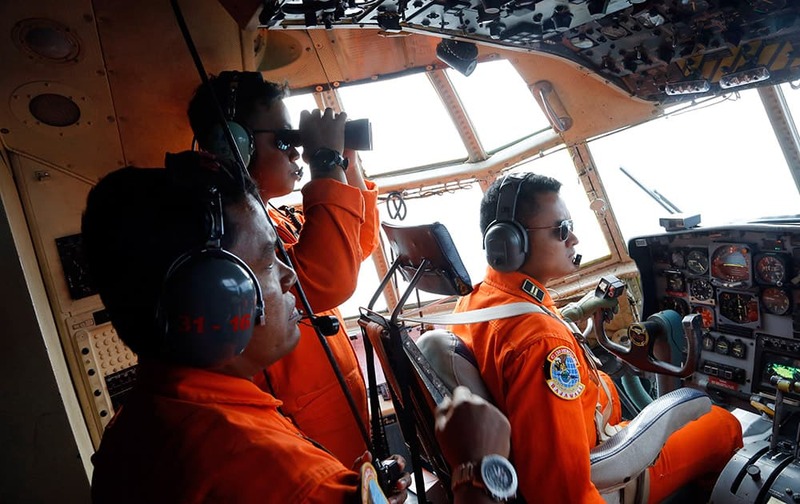 Crew of Indonesian Air Force C-130 airplane of the 31st Air Squadron scan the horizon during a search operation for the missing AirAsia flight 8501 jetliner over the waters of Karimata Strait in Indonesia. 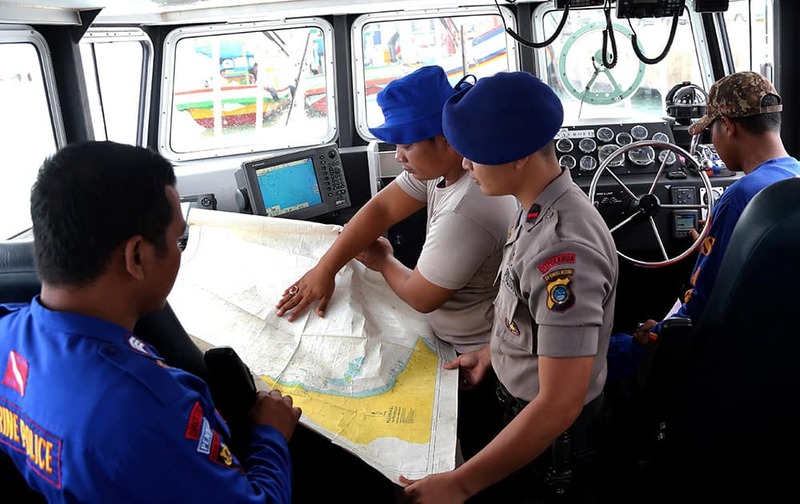 Members of Indonesia's Marine Police prepare to head out to sea in search for the missing AirAsia flight QZ8501, at Pangkal Pinang port in Sumatra Island, in Indonesia. 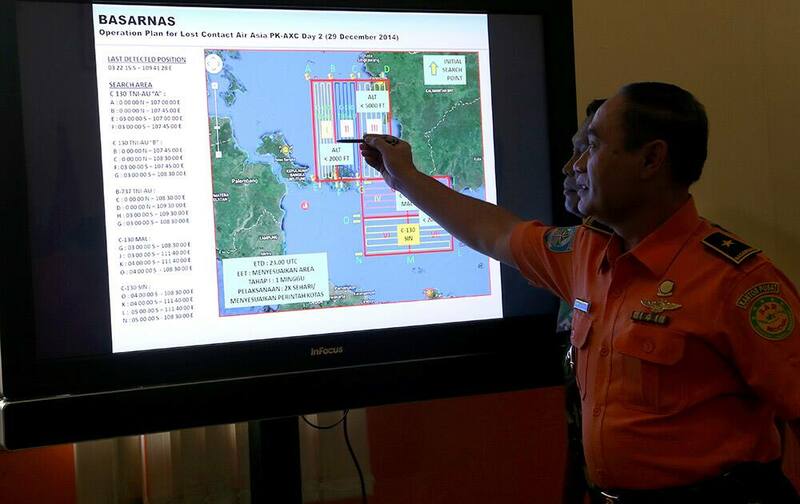 A member of Indonesian National Search and Rescue Agency (BASARNAS) shows a map of searching area on screen during a briefing prior to a search and rescue operation of the missing AirAsia flight QZ8501, at Pangkal Pinang command post, Sumatra Island, Indonesia. 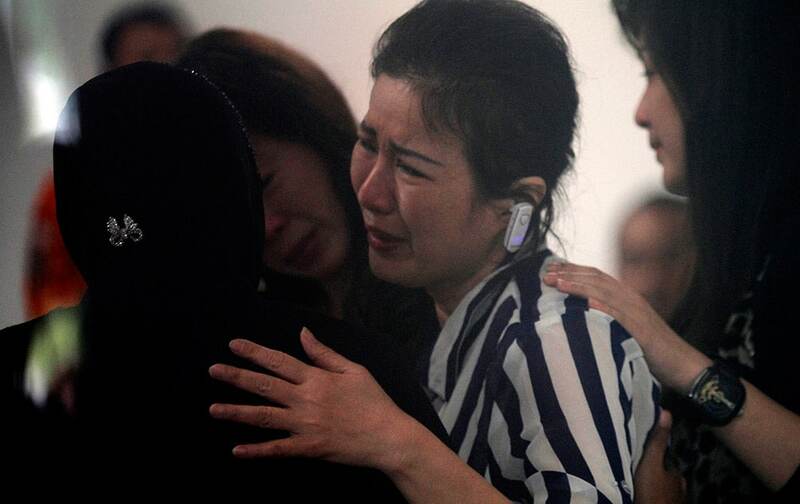 Relatives and next-of-kin of passengers on the AirAsia flight QZ8501wait, some in tears, some comforting each other, while others keep in prayer, for the latest news on the search of the missing jetliner at Juanda International Airport in Surabaya, East Java, Indonesia. 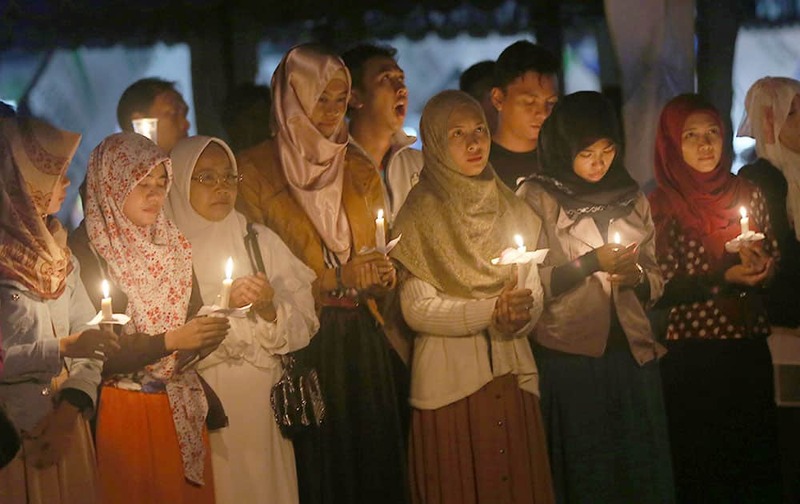 Relatives and next-of-kin of passengers on the AirAsia flight QZ8501 wait for the latest news on the search of the missing jetliner at Juanda International Airport in Surabaya, East Java, Indonesia. 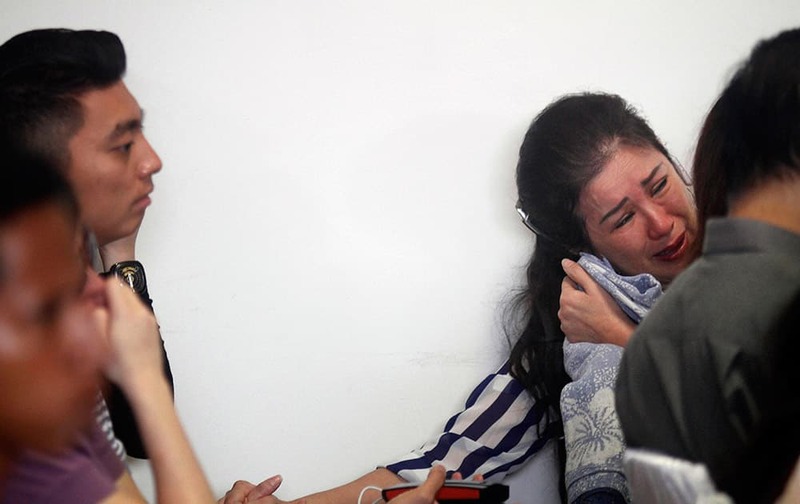 One of relatives and next-of-kin of passengers on board the AirAsia flight QZ8501 cries as she awaits the latest news on the search of the missing jetliner at Juanda International Airport in Surabaya, East Java, Indonesia. 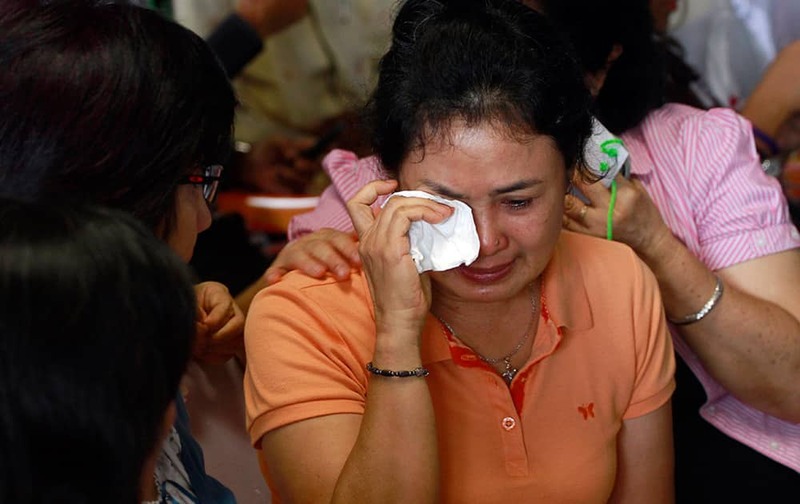 One of relatives and next-of-kin of passengers on the AirAsia flight QZ8501 wipes tears as she awaits the latest news on the search of the missing jetliner at Juanda International Airport in Surabaya, East Java, Indonesia. 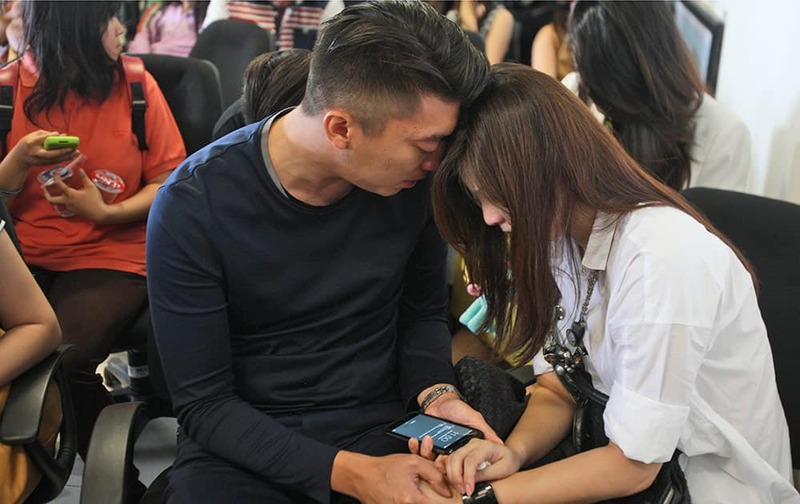 Relatives and next-of-kin of passengers on the AirAsia flight QZ8501 comfort each other as they wait for the latest news on the search of the missing jetliner at Juanda International Airport in Surabaya, East Java, Indonesia. 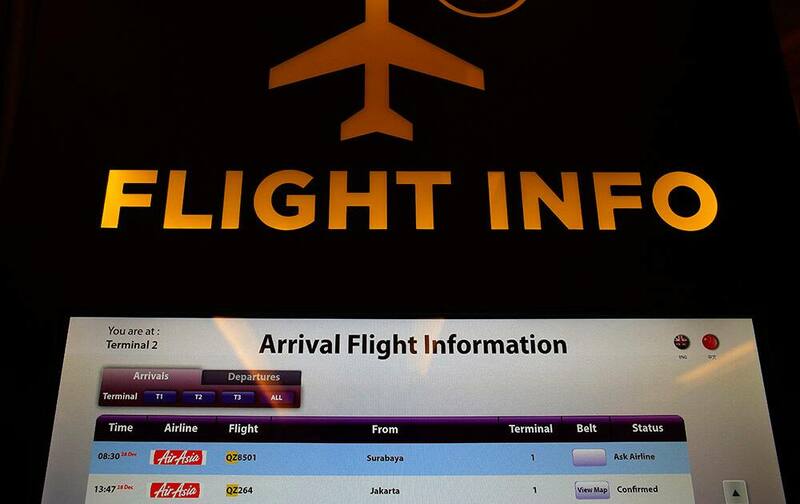 An electronic kiosk providing flight information shows the status for AirAsia flight QZ8501 from Surabaya to Singapore as "Ask Airline," at the Changi International Airport in Singapore. 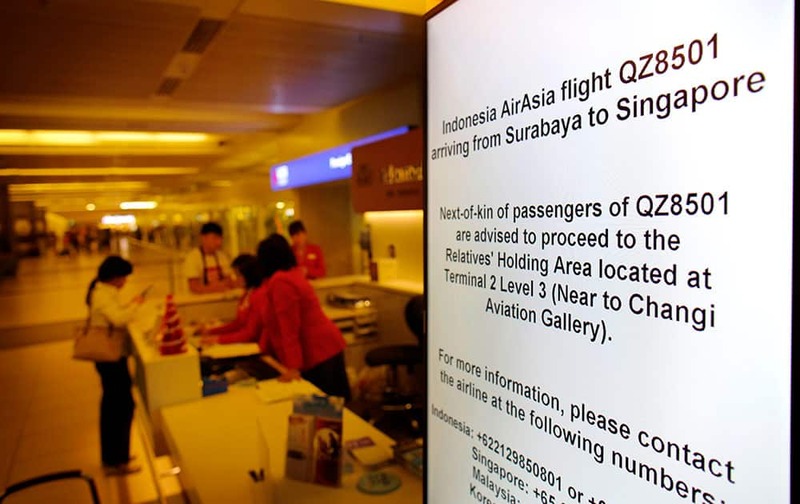 Electronic sign boards instructing relatives and next-of-kin to gather at a holding area are placed in various places at the Changi International Airport where AirAsia flight QZ8501 from Surabaya was scheduled to land. 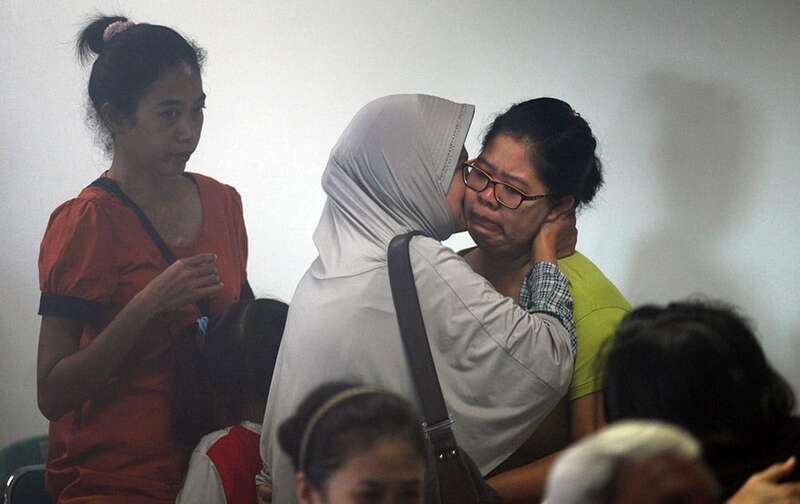 Relatives of the passengers of AirAsia flight QZ8501 comfort each other at Juanda International Airport in Surabaya, East Java, Indonesia. 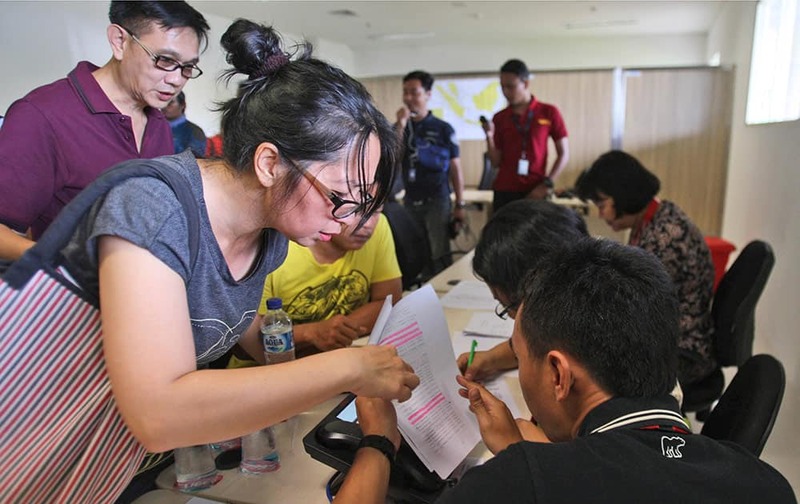 Relatives of the passengers onboard AirAsia flight QZ8501 check the plane's manifest at a crisis center set up by local authority at Juanda International Airport in Surabaya, East Java, Indonesia. 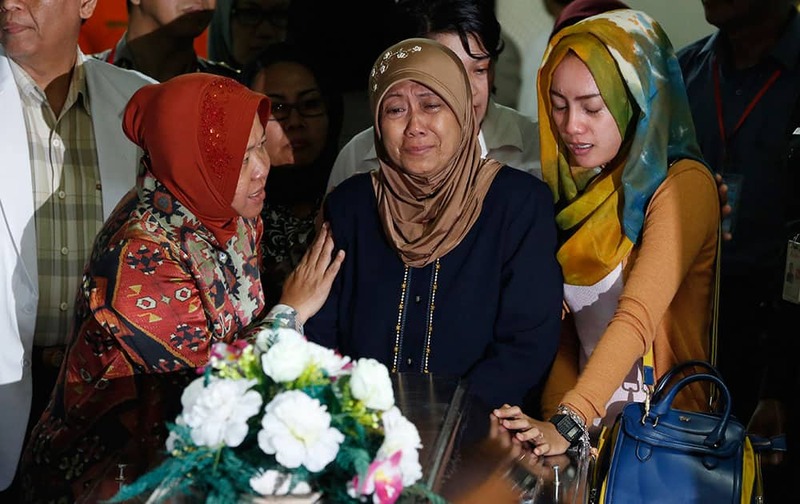 Relatives of the passengers of AirAsia flight QZ8501 wait for the latest news on the missing jetliner at a crisis center set up by local authority at Juanda International Airport in Surabaya, East Java, Indonesia. 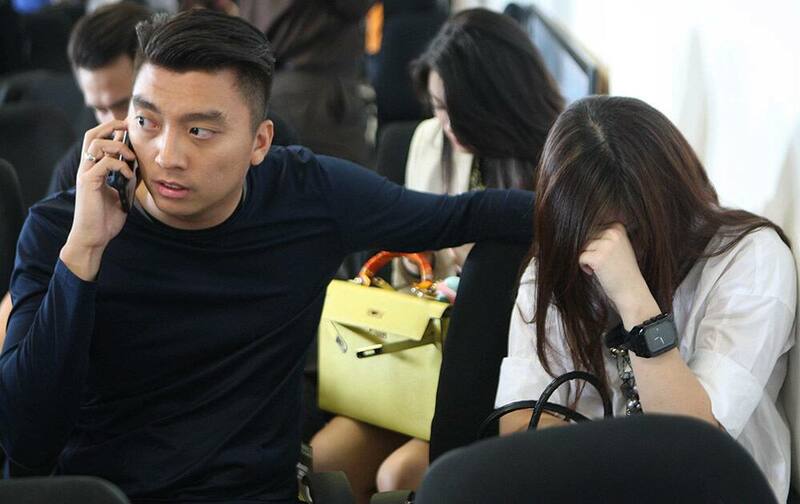 Relatives of the passengers onboard AirAsia flight QZ8501, check the plane's manifest at a crisis center set up by local authority at Juanda International Airport in Surabaya, East Java, Indonesia. 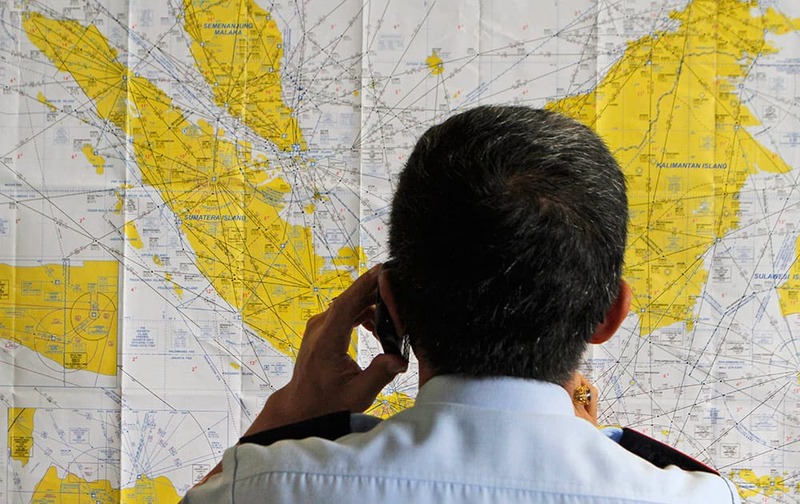 An airport official checks a map of Indonesia at the crisis center set up by local authority for the missing AirAsia flight QZ8501, at Juanda International Airport in Surabaya, East Java, Indonesia. 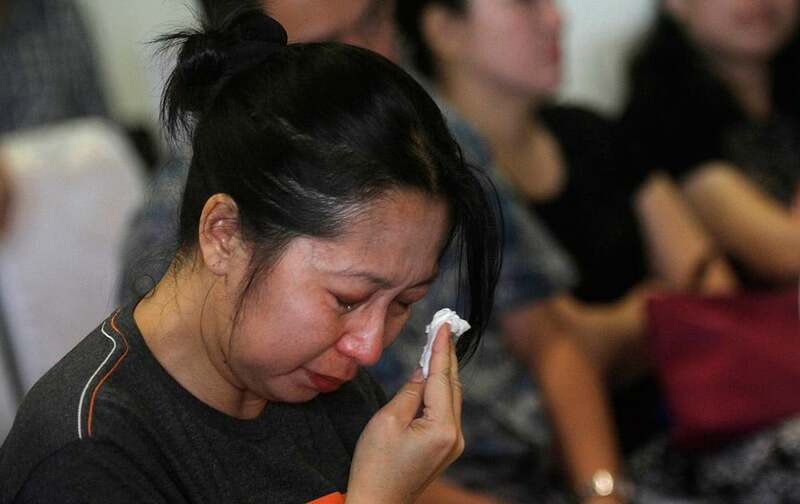 A relative of the passengers of AirAsia flight QZ8501 weeps as she waits for the latest news on the missing jetliner at Juanda International Airport in Surabaya, East Java, Indonesia. 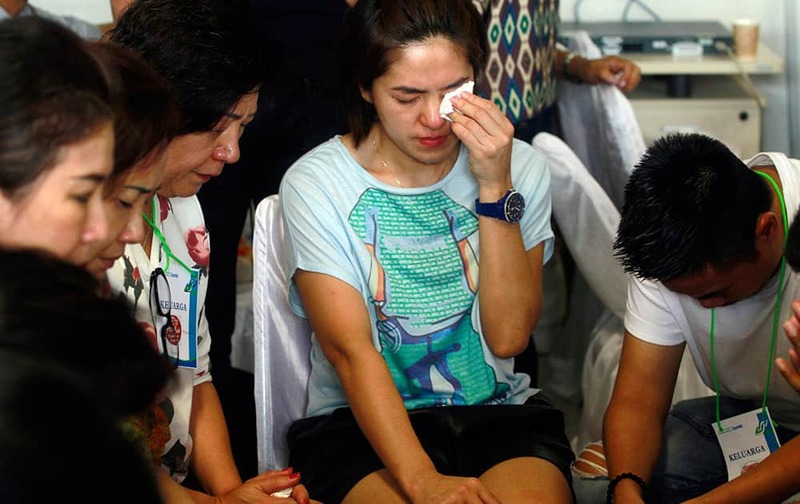 A relative of Air Asia flight QZ8501 passengers weep as she waits for the latest news on the missing jetliner at Juanda International Airport in Surabaya, East Java, Indonesia.